A new video showing the moments before Officer Michael Slager killed unarmed Walter Scott by shooting him in the back has been released by South Carolina police. The new footage shows Walter Scott’s car being pulled over and Officer Michael Slager asking for his paperwork. After Michael Slager returns to his police vehicle, Walter Scott opens his door and runs, leaving a passenger in the car. Michael Slager was arrested on murder charges after another video showed him shooting at Walter Scott as he fled. The newly released video from the officer’s dashboard camera shows Michael Slager pulling over Walter Scott’s Mercedes sedan due to a broken tail light, and asking for his driving license and registration. Walter Scott explains that he is in the progress of purchasing the vehicle and does not have the correct paperwork with him. 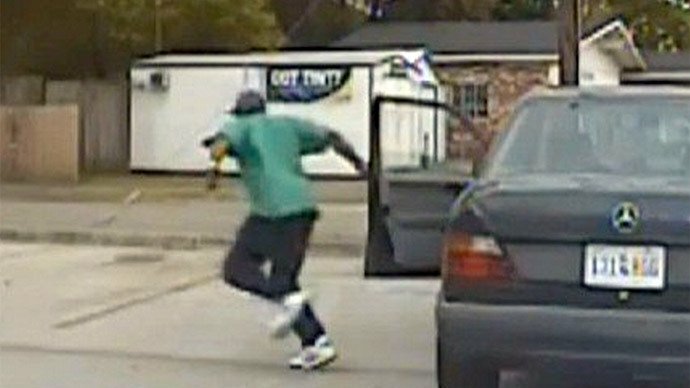 Although the video does not capture Michael Slager firing eight shots, gunshots and shouting are heard off-screen. “Get on the ground now!” Michael Slager is heard shouting. Later in the video, another police officer questions the passenger in the car and releases him. Lawyers for Walter Scott’s family told CNN that they are looking for the passenger. After the first video of the incident emerged on April 7, protesters held rallies in North Charleston, chanting “no justice, no peace”. They are the latest protests about police use of lethal force, which began after the killing of Michael Brown, a teenager in Ferguson, by a police officer who was not charged for his death. Feidin Santana, who filmed the first video on his mobile phone, said he turned over the footage after reading the police report’s description of the killing. “It wasn’t like that, the way they were saying,” Feidin Santana said. Michael Slager, who is being held in jail without bond, was fired on April 8 from the North Charleston Police Department. It has also emerged that Michael Slager had a prior complaint made against him about using force.